What is genuine curry flavor? I don't know because—let's start at the very beginning—an Indian curry is nothing but a dish with a sauce or a liquid base that may or may not have a blend of spices. By now, most folks know that there is no magical curry powder. Curry powder was invented by the British and, while I may forgive you for having a jar of that in your spice rack, I won't be as nice if you think that adding a spoonful to your food will transform your dish into an Indian curry. No, it just doesn't work that way. Indian cuisine is so rich and varied that even the ubiquitous garam masala is different from region to region, and from home to home. There is nothing to prevent you from coming up with a blend that highlights the flavors that you like. There is, however, a generic blend for garam masala based on the region and the type of food being prepared. Curry leaves, on the other hand, are aromatic fresh leaflets of a compound leaf used mostly in western and southern Indian cooking, not so much in northern Indian cooking. The botanical name for the tree is Murraya koenigii, which is native to the Indian subcontinent. If you've had the good fortune to smell these leaves, you will know that they have a mild citrusy aroma and, therefore, you will not be surprised to learn that the tree belongs to the citrus family, Rutaceae. The leaves are called kadhilimb in Marathi, kadipatta in Hindi, and kariveppilai in Tamil. The Tamil word kari can be translated loosely to mean sauce, and is often considered to be the origin of the English word curry. And therein begins the confusion! It is possible to make Indian curries without curry leaves. Chicken makhani is a curry, yes? Genuine curry flavor but no curry leaves. Chhole—or chana masala as it is widely known in the US because that's what the restaurants call it—is a curry, yes? Genuine curry flavor but no curry leaves. Smart people usually get it by this point. 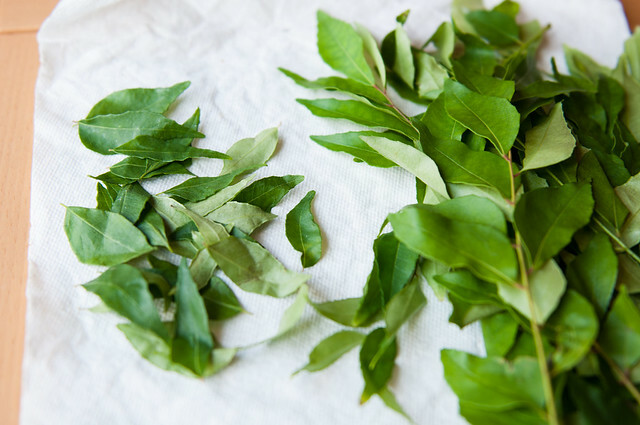 How are curry leaves used? Individual leaflets are often dropped into hot oil, usually with mustard seeds, asafetida, and green chiles—a phodni or a tadka. This seasoned oil may be the first step in cooking a dish or the last step. The dish may be a dry vegetable dish, a dal, a curry, a raita or even a savory snack. Dried curry leaves have next to no flavor and the longer they sit, the more you can bid goodbye to the aromatic oils in the leaf. However, dried curry leaves are often ground to a fine powder and mixed with ground dals, tamarind and spices to make a dry chutney. When I had my own curry leaf plant, I made this chutney on a regular basis and it had a fantastic flavor of curry leaves, only because I had dried the leaves myself and used them in a chutney almost immediately. Just remember that there is a Mediterranean curry plant, Heli­chrysum italicum but its herbal flavor is more like that of sage. Note the lack of the word leaf in its common name. This herb is not used in Indian cooking. There! I feel so much better already! But wait, there's more. When curry leaves are dropped into hot oil, it is usually done with a great deal of flourish, resulting in a mess on the stove, adjoining counters and the hood. Think about it: when else do you knowingly add dripping wet leaves to hot oil? There is no need for this drama, truly. Unless you have minions to clean up after you. Dry your curry leaves after rinsing them in cold water by rolling them up in a paper towel or rubbing them dry with a clean kitchen towel. Always have a splatter-guard or a lid handy to cover the pan in which you are cooking, regardless of whether you have dried your curry leaves or not. Drop the curry leaves into the hot oil and cover immediately to avoid a mess. Do the same for green chiles. Wash and dry them before you slice or chop them. When you finally add them to hot oil, your stove and your back will thank you. In my last post of 2012, I had promised to share a recap in my first post of 2013. Here it is: 2012 Recap (with way too many pictures). Love this! Just had this convo on my Facebook stream recently. Curry is to soup as salsa is to sauce. Wishing health for you and your family plus my condolences over the sweet kitty. Hey, Take care dear and so sorry to hear about the kitty! I love the smell of curry leaves. They make a total difference in tadka. So sorry to here about the kitty. You have articulated so well the reason for the flash of irritation I feel when I hear curry powder and curry leaves mentioned in the same breath. Mint retains its oils even after drying but that is so not the case with curry leaves. And yet when they are pan dried/fried, the flavour is stabilised. I don't understand the chemistry at all but that is how it is. I once bought a jar of curry powder in the US just so I would know what the heck it really is! But, is chhole a curry? I think it is usually not associated with beans and pulses. Sorry about the loss of the kitty. That was a very informative post on curry leaves which should be required reading for chefs and foodies(?) who claim to love "curry". I once saw Jamie Oliver throw four sprigs of curry leaves and almost a handful of mustard seeds to cook some kind of 'curry' dish on his show. I can imagine how pungent that curry must have turned out. And he thought he was cooking authentic Indian food. Take care And so sorry about the kitty..
Anjali, it's the season for colds, coughs and the dreaded flu. We're washing our hands very often! And thanks! Kia, thank you! And yes, your analogy is on the money! Sarah, I think you're thinking of the term curried more than curry. Curried is now used to describe anything that has curry powder or a spice blend. Indian food bloggers aren't helping much by bending over backwards to describe our food in English. I just saw a recipe for okra curry which has no sauce but has spices -- uh, which Indian dishes almost always have! O.o I know. And I'm sorry. My people are part of the problem! For us, curry is a noun and it describes a dish that is soupy or has a sauce or is a stew, not really a method. Charul, the curry leaves we get here aren't half as flavorful as the ones in India. I have to use a lot more leaves. And, yes, they elevate a tadka to new heights! madteaparty, dried mint leaves are pretty anemic but definitely better than dried kadipatta! My understanding is that the flavors in kadipatta are soluble in hot oil and it's the oil in the tadka that then transfers the flavors to the dish it's added to. And, see, this is what I mean! Indians don't know or understand curry the way it is used in the West. The Marathi word for curry or a dish with a sauce or liquid base is amti. And you can have an amti for nearly everything edible: dalichi amti (dal), masalachi amti (fish curry), moogachi amti (moong curry), and so on! DSM, whatever was Jamie Oliver making?! We are a complicated people with languages that don't translate easily into English, making our cuisines that much more difficult to understand and describe. What to do? We are like that only. I am so sorry about your kitty. Take care of you and Medha. And oh, much as I enjoy cooking, the cleaning part is a pain, I find myself wishing for a minion.sigh! Poor Manisha, you have really been through it. I'm sorry it's been such a rough start to the year. Just remember, women are like teabags: we often give the best of our inner selves when we've been dropped in hot water and vigorously stirred! ;) Thanks for your post about kadipatta; dried in a bag, from the UK, is the only way I can get it here. I've tried it a couple of times and thought, "meh." Now I know why. Sigh! Very nice! And I'm glad you addressed this to dispel the annoying assumptions... pet peeve of mine too! DSM, me, too! Me, too! Anna, I love love love that analogy! Thank you! It certainly cheered me up! I thought of you as I wrote this post, knowing that you can't get fresh kadipatta. The next time I see tender leaves at my grocer's, I am going to try making a thokku of sorts and if it captures the essence of kadipatta, there will be a bottle with your name on it. I promise! Pel, yay! You and me, both! BTW, is 2013 the be-nice-to-Manisha-year? I'll take it, especially given the dismal start. I was whopped by a few other things a couple days ago, but I'm learning to take it in my stride. Life. Manisha, sorry to hear about the kitty. Hope by now both of you are on your way to recovery. Curry for me is something with gravy which is in a way unique to Indian cuisine no?. Also when people use curry powder to refer to a blend of spices it does not bother me that much. My neighbor gave me a bag of curry leaves. I washed and dried them with a kitchen towel and froze them almost immediately. I find that they retain their flavor at least half way through this way. It's like the ubiquitous "curry powder." As if there were only one in the world. If I see that in another Web recipe I will scream. And I was just told by someone that she "hates curry powder." Repeat after me, all ye learner cooks: There are as many spice blends as there are cooks. If you don't like a certain one, learn a little and make your own. My first time on your blog..it's great. Indian good does rock! Coming from northern India, to make everything taste "so called" South Indian, we add curry leaves. I know it's so stupid, but oh well, I sometime do that too! None of the Bengali dishes have curry patta. A large part of eastern India are or at least were unaware of curry leaves until last century. Now what is a gravy based Bengali dish then ? Curry or HaraKiri ? Ah! The Curry conundrum! A pet peeve of mine, as well! I loathe when folks respond with, "Oh, I don't like curry" when I ask if they like Indian food. AS IF the entirety of Indian food is just curry. I usually launch head long into a discussion of, "Do you know what curry is?" And extrapolate/expand upon curry leaf; how curry powder could be any number of a combination of spices; or curry could simply be a dish that has a gravy to it. And now I'm thinking of the dish Punjabi Khadi (sp)... I now have to look at my recipes to see if any of the khadi have kari patta to it. Sigh. Then of course, there's the bajji, bahji, etc conundrum! My spelling for desi dishes will almost always be wrong, but at least I know the differences.